Kansas City quartet The Browning — Jonny McBee [vocals, electronics], Brian Moore [guitar], Collin Woroniak [bass], and Cody Stewart [drums] — will hit on a late winter/early spring tour in support of their third album Geist, out now through Spinefarm Records. 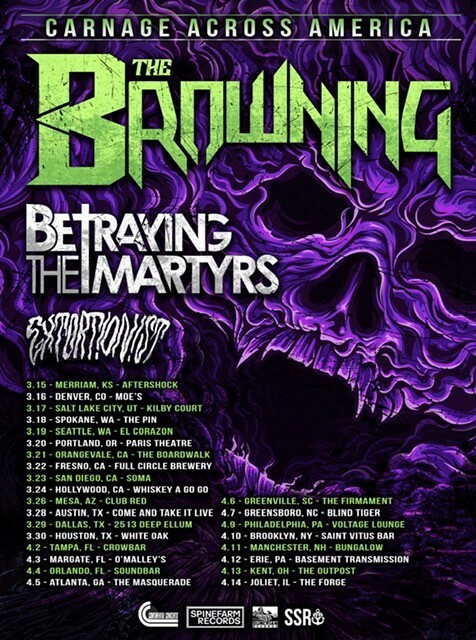 The band will be joined by Betraying the Martyrs and Extortionist on this run, which kicks off on March 15 and runs through April 14. All dates are below. Check out the song “Carnage,” featuring Jake Hill. Listen here. The band also unleashed the video for “Final Breath” via frontman McBee’s Twitch Channel. Watch it here.